Reviews | 1/2 Size Bun Pan Cover - 18" x 13"
1/2 Size Bun Pan Cover - 18" x 13"
Keep your pastries protected by covering them with this 1/2 size sheet pan cover! Made of durable polypropylene, this bun pan cover ensures visibility of your goods, yet protects your products from dust, germs, bugs, and other airborne contaminants during service and storage. It's perfect for use at catered events, breakfast buffets, dessert stations, and other areas where delectable desserts and pretty pastries are essential to your service. These half sheet pan covers really come in handy! They fit all of my half size pans perfectly, no matter the brand. I often use them when I need to save space and stack pans...The covers protect whatever food is inside! Love these bun pan covers! They make your half sheet pans stackable which is a huge plus for high food volume kitchens - highly recommended. These are the best invention! They keep your food fresh on the sheet pan and allow you to stack them on top of each other. Keep several of these around...You won’t know how you lived without them! this was a perfect find!! we love this lids. they allow us to stack products and protect them from breaking. we love them!!!!! you can freeze them also and they are dishwasher safe! I often have baked goods that I leave on the sheet pan that I still need covered as they are stored in the freezer. These work really great for shallow items, like cookies, brownies, bars, macarons, etc. The only reason I can't give it 5 stars is because it's sometimes not tall enough for mini cupcakes without smooshing the top of the icing. I really wish they were just about a half inch taller, then they would be perfect! I have over 50 of these pan covers. I use them daily and they fit well over the half sheet pans. They fit snuggly and do not pop off. These. Are. AMAZING! They keep your cookies fresh over night and protect them from little kitty paws that may try to sneak a peek at the treats. I can cover the matching pans overnight while my RI dries and since they are not air tight the cookies and icing dry just fine. The only downside is since they are not as air tight as I would like they do not do well for long term storage. These are awesome. They seal nicely so we can keep donuts, cookies, and other baked goods fresh all day. I was happy to find these on Webstaurant. 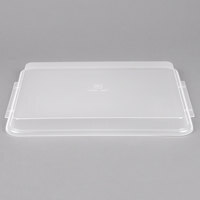 This 1/2 Sheet plastic pan cover fits the Vollrath baking sheets PERFECTLY! They are snug fitting for use in the refrigerator when proofing dough and they keep finished goods fresh as well. These just arrived and I am SO HAPPY! Where have these been all my life?? I ordered several for myself and my HS culinary classroom. I know these will get tons of use! They clamp on so nicely to the sides of the bun pan and stay in place. These will be amazing for stacking and keeping my baked products fresh! These are the best invention! I am a cookier and having these bun pan covers has drastically improved my efficiency. I am able to stack multiple pans with cookies in them to save on counter space. This helps when I need space to decorate or roll out more cookies! These worked well for keeping lint or my kids out of my cookies I just wish they had more of a snug fit. Some were a little misshapen but still worked for what I wanted. Great for stacking my cookies while working on them. I'd order these again. We have loved having extras of these on hand. Works great for keeping product fresh and being able to stack sheet pans in the freezer. Great quality lid and fits that half size sheet pan perfectly. This makes it easy to store food on the pan and easy to stack as well. The lid is very sturdy and you could easily stack a few pans on top of each other with this lid on it. Highly recommend getting this along with the half sheet pan. What did I ever do without these. Great for covering pans so that you can stack and save space. Only issue I have had with a few of them is sometimes they will not stay on the pan well, maybe a little warped. Great durable product. Works well to cover our sausages that live on 1/2 sheet pans. Goes through the dishwasher just fine and easy to store as they stack easily. We love these. FOR EVERYTHING! I can’t say enough about them. We use the. While our cinnamon rolls proof, to cove product that we will serve or package later. Indispensable product. I've used this product over 20 times now. I have hand washed this Bun Pan Cover and thrown them on a long cycle in a Commercial Dishwasher. After 20 uses it still maintains its strength. Half size bun covers fit our sheet pan perfectly to protect our fresh foods and prepared items in the cooler. They are low profile enough to fit in the sheet fridge. 1/2 Size Bun Pan Cover - 18" x 13" is great for individual sized breads. We use them for our mini pizza doughs and our pitas. I like that they offer lids for the baking sheets. It helps me a lot when decorating cookies. It's just a shame that half of the lids were too warped to attach to the pans. Thank you for your review, Emily! We are sorry this 1/2 Size Bun Pan Cover - 18 inch x 13 inch has not worked well for you. A Customer Solutions Representative will contact you soon! I wish I would have known about these sooner! Such a great idea to cover a pan and pop it in the freezer or refrigerator. I also use the pans to dry decorated cookies on so when I want to cover them, I no longer have to struggle with saran wrap or foil! These are awesome!!! Love these!! I use to store or dry decorated sugar cookies overnight. I also use to cover up any baked goods that I’m using/decorating at the moment. These covers are great. They are sturdy and they fit the pans perfectly. They stay on, but aren't as secure as others I've had. They work well for their purpose though! This cover is a must have for covering up my cinnamon rolls when I have them on display and then they can go directly into the frig. I needed a cover for my sheet pans so my cookies would stay fresh and this lid did not disappoint! It covers my tray easily and it even helps me take my trays from place to place and I know my cookies will stay fresh and intact. Absolutely loves these pan covers. They are great for covering up pans that you don't want left open. Easier and way more efficient than covering with foil! These covers fit half size pans and are great for when catering to deliver cookies, brownies and small desserts. You can stack pans with covers on top of each other. Perfect cover for 1/2 pans. I have used these to cover items on the counter to ensure that no debris ends up on anything. I also use them when placing items in the cooler--great product! I love these bun pan covers! I bake cookies and they help keep them fresh and sanitary. I have several and some fit better than others but they still work just fine. These lids are the best! They are great for cookie decorators to store cookies in between decorating. Highly recommend. I am going to stock up now. i was absolutely ecstatic to find these bun pan covers! I make cinnamon rolls on my bun pans and covering them in plastic wrap is not only a pain, but smashes the frosting. These are just high enough that they do not smash my merchandise. These are perfect! The only down fall is the extra lip which does provide insurance that my sheets pans do not fall off the rack. However, it does hinder my efficiency. Even still, 5 starts since keeping my baked items protected and fresh is of higher importance and they provide just that! 1/2 Size Bun Pan Cover is so sleek looking and for I love it more due to the affordable price. It keeps our products safe packed and free from dust and bacteria lurking around espescially when trabsporting them off-site. The material used washes easily and is really durable. It fits like a glove on my half bun pans. Great buy! This sheet pan cover would be great if the lip did not extend over the edges making it so that I cannot put it right back onto the bun pan rack. Also, I received mine cracked in two places and cannot use. Thank you for your feedback! We are sorry your 1/2 Size Bun Pan Cover - 18 inch x 13 inch was defective. Your account has been credited! We use these with the sheet pans for making peanut butter balls. The cover helps us stack them in the refrigerator and freezer for chilling the peanut butter balls. We need more. We are plan on using them for sliders during lent. I ordered 4 bun pan covers, 2 did not close correctly. Product consistently is a concern. They are sturdy enough to allow for stacking of trays . The only other problem is they do not fit on a speed rack because the handles stick out to far. This bun pan cover fits Nordic Bakeware half size pan perfectly. I've tried some that have been loose and popping off when in use, not a problem with this one. As it is new, I don't know about the durability yet, but at this point I would recommend the product. These bun pan covers are perfect. We use them when we make our rolls each day for proofing. The quality is great and I would highly recommend. I ordered two of these half size bun pan covers. One fits perfectly while the other is just a hair short so that it gapes across one end. I'm not sure if this is a defect or if it is just a slight variation in size. The one that fits fine is good unless you want to travel with it as they do not snap on. This lid works well. I wish it was available a little taller but it stays on the pan and keeps products fresh. I will buy more. LOVE these pan covers! I ordered 3 of them, along with some half size bun sheet pans from here. I was delighted to discover that these also fit the half size bun pans that I already owned! They make stacking and traveling breeze, when you are dealing with lots at once. They also keep the products inside very moist. I was surprised to find that they do not snap or seal. They simply rest down on the pan and you just lift them off in order to remove. This has not been a problem for me. They are easy to clean and look and function great. For rolls, the lid will just barely push down on the tops when you cover them. But alas, they pop back up and it is worth it still. Lid protects them so nicely during travel and keeps them undisturbed from the air. Bars or sheet cake or anything else will remain undisturbed by putting the lid on. LOVE! We used them to keep baked goods covered and protected from dirt. It sits well on a half size baking sheet and the best part, it makes baking sheets stackable. I'm so glad I came across this product. A must-have! Bun pan covers are a great way to store and transport your pastries. I can make a batch of cookies, let them cool, snap on the lid, and my husband can take them into work as-is. This all means minimum clean-up for me, but the hard part is getting your containers back from the office, ha ha. Great for covering pans just to protect product, but also good for proofing some items that are not intended to rise to high. Keeps products fresh and delicious. These are great for keeping items protected in my pans. I've also used them to transport items. These are a universal lid, and don't snap tight on the pan, so I do recommend covering with plastic wrap if you'll be travelling with them. I will definitely buy again. These lids fit very good over the Baker's Mark 18x13 sheet pans. They are raised enough to fit taller things under when traveling with food items. These covers are exactly what I was looking for and they fit all of the 1/2 size pans that I've also purchased on the site (Baker's Mark). They don't securely 'snap', although there are edged hooks that should accomplish that. But even without that they still work to keep dust/debris off and provide a fair degree of air-tightness. These tops are quite versatile. While I appreciate that they cover the half sheet (13x18) trays, they also serve as serving trays themselves. I used them to serve half subs in. I also plan to use them to put ice in them and then to put items that need to be kept cold on them or on the metal half trays and place the trays on them. great bun pan cover, it works wonders to keep in vital moisture in baked goods, also protects from dust and bugs, a must have if you use sheet pans. I was hoping these covers would close tight to keep bars and brownies fresh in the pan; however, they fit very loosely and don't really serve the purpose I wanted. They are nice if you just need a loose cover for the pan. I bought 4 of these pan covers that I use when I transport cookies or miniature cupcakes to a homeless shelter. they are the perfect height to hold miniature cupcakes or a couple layers of cookies. I will order more when needed but they look as if they are made with decent quality, so i shouldn't need to replace them anytime soon. good all around sheet pan cover. i wish they made these lids that would click/snap into place but i've yet to find them. they're sturdy and solid and make it easy to stack lots of pans on top of each other. very helpful and a good deal. This pan cover looks nice and is made of good strong materials. My only complaint is that it doesn't fit the pan as tight as I would like it to. This bun pan cover is awesome - fits all brands of 1/2 size bun pans. It snaps onto the rim of the pan, but be aware it doesn't lock on tight, so you want to be sure to carry this by the bottom of the pan. Makes it easy for stacking lots of batches on top of each other. I purchased this along with a half sheet pan and it fits very nicely. Great for taking along one of those sheet cake that are so popular right now. I love have these to put over my sheet pans to help keep my cookies fresh. Theyre not an air tight seal they just sit on the trays but I like know know my cookies are covered. They're also use for when transporting sheet trays of cookies to a craft show. I just tape the lid on and I can stack quite a few trays. I love the pan cover for my 1/2 sheet pans they fit so nicely. These are handy when storing food on top of each other in the fridge or taking food to parties. These are great! They fit all my half sheet pans even the ones bought elsewhere, but for just over 6 bucks a set, I now purchase all my sheet pans and lids from Webstaurantstore.com. I already have four sets and I am back to order more. Super fast shipping! I couldn't live without these pan covers. It helps me transport my royal iced cookies to events and store things after they've cooled in my bun pan rack! A lifesaver for sure! I love this cover, for cookies, prepping meals ect. Creates a nice tight seal on the pan and makes my life easier. I LOVE this cover! I wish it secured onto the bottom sheet pan that it fits over, but otherwise this is a wonderful product for traveling. These are the answer to reducing my plastic wrap use by a lot. I cannot believe I didn't know these existed and they are inexpensive and work and fit great. This sheet pan cover fits well on the half-size sheet pans. It is not a very tight fit like a lid would be, but it does cover the pan. I found it works better if the pans are stacked because it helps to hold the covers on a little tighter, so less air gets in. These covers work and fit great. I like that it allows one to have products and stack them on top of another. Be aware that these do not create an airtight seal and should not be used to store things long term. I bought 10 of these my first go-round. They are a sturdy hard plastic and snap on my bun pans perfectly. They allow enough room to stack my cookies in twos or even threes if needed. I am definitely going to buy more in the future! These are exactly what we needed for our half sheet pans. However, they are not air tight although they do snap on the pan via little clips on the sides. The only problem is that they won't fit in a rack since the tabs on the sides stick out too far. We ended up cutting the tabs off to make them fit. Easy fix with no loss of functionality. Does what it's supposed to. The only thing that I wish that it did that it does not is snap onto the pan. Other than that does a good job and sits on the pan and fits perfectly. This pan cover is very useful for storing items that need to be left on the half sheet ban. The height of the cover is perfect! These are great to have on hand to cover fresh baked goods. I use them to cover frosted cinnamon rolls and store in the freezer. Sturdy and for the price you can't beat it. These pan covers are one of my FAVORITE things I have ever bought for my home bakery. They snap right onto the sheet pan (IF YOU BUY THE RIGHT PAN) and they are just so handy. I hate the amount of plastic wrap I was using, so now I can use these to go over pies, cookies, etc and not have to use so much plastic. They also have the added feature of making all of these sheet pans stackable! If you are tight on space, these are a game changer- extra counter space, extra fridge space, they're just wonderful. The ONLY issue I have at all with them is that I can't slide a covered sheet pan back onto the pan rack because the handles on the cover make them not fit, but since they stack so well, it's really no big real at all. I will definitely buy more of these! These bun pan covers come in handy when transporting my goods. The covers don't "snap" on as I thought they would however I just stick rubber bands around them and they are good to go. These fit nice and snug on the half size sheet pans. I only wish that they would fit on the pans when in a bun pan rack but the cover is too wide. These pan covers do not do not seal at all. Much too large even after soaking them in hot water to shrink them a bit. I ordered them with the half sheet pans of the same brand so there really isn't a reason why they shouldn't fit properly. If you need them just for stacking they will do that. If you need any kind of seal at all, don't bother. You'll waste your money. Thank you for your review! We are sorry you were under the impression that these would provide a tight seal over your bun pan. These are mean to aid in keeping food contaminant and particle free and are not meant to be a transport solution. terrible and a waste of money. They do not fit a standard 1/2 size sheet pan. So they don't do what I purchased them for: to seal a pan for storage in the refrigerator and freezer. Even trying to tape them did not make them fit securely. A waste of money. I have to go purchase the more expensive ones elsewhere. Thank you for the review, Louise. We are sorry the covers did not work for you. For your reference, we’ve placed the exact dimensions on the site so you can know whether or not it will fit your pan. I have to say that I love my new covers for my half sheet pans. I won't have to transfer cooled cookies to sealed containers to keep them fresh while waiting to decorate. Another time saver. ...and I can stack them. Space saver too! Woohoo!